BOCA RATON, Fla. – A Florida member of the Freedom From Religion Foundation says that he plans to erect a large pentagram in a city park this December in an effort to counter Christian and Jewish displays regarding the birth of Christ. Smith, who was raised as a Catholic but now describes himself as an atheistic Satanist, says he likes the pentagram because it represents “the polar opposite of everything that the Church stands for.” He views Satan as a metaphor for rebellion rather than an actual being. Smith describes his pentagram as a protest against nativity scenes and other religious holiday displays. According to reports, Smith put up a similar Satanic pentagram in Boca Raton last year, but it was repeatedly vandalized and knocked down. The earliest Smith will be allowed to erect his display in the city park this year is December 1. City officials said even though the Satanic pentagram is offensive, Smith is free to display it in the park. “This is not consistent with my particular values, but free speech means people have an opportunity to express themselves, whether government likes it or not or whether individuals like it or not,” likewise stated city council member Scott Singer. However, one local pastor has vowed to knock down the controversial figure once it is erected. 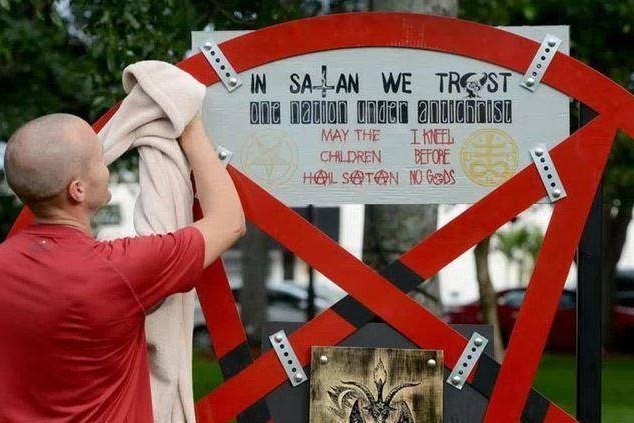 Describing the Satanic display as “the essence of evil” and “a welcome mat for Satan,” Mark Boykin of Church of All Nations said he plans to use a sledgehammer to dismantle the display. As previously reported, in 2014, Smith presented an invocation at a Lake Worth commission meeting, during which time he seemed to mock Christianity, or religion in general, by naming off everything from Mother Earth to Zeus.